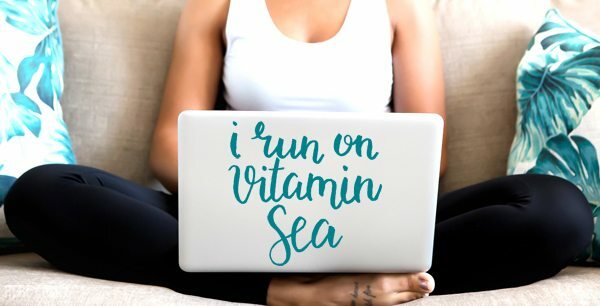 If you’ve been a longtime reader of my blog, you know of my love for the ocean, Last week I shared a my Vitamin Sea watercolor print and today, I have turned that print into a free cut file for you to download. If you’ve never used a cut file before, you probably have some questions. Here are the answers to some of the questions that I had when I was getting started with cut files. 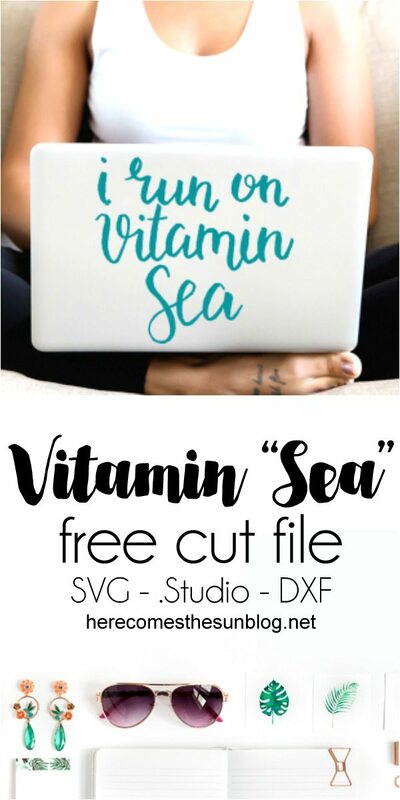 A cut file is a file that you download that can be cut out using a personal cutting machine such as a Cricut or Silhouette. What do you use cut files for? After you cut out the file, you can place it on anything. Cardstock, water bottles, t-shirts, your wall.. etc. How do you make the cut file stick? I recommend cutting the file out on adhesive vinyl. You can then stick it to anything. This post will show you how to transfer your design using transfer tape. Make sure you do a test first if you are placing the design on your wall to be sure that the vinyl does not leave a residue or tear the drywall off when you remove it. I learned that one the hard way! If you are planning to use the cut file on a piece of clothing, you will need to use heat transfer vinyl (HTV). Here is a tutorial for the application of HTV. You can also cut the file out using cardstock and place some adhesive on the back to place on the front of a greeting card. If you are using a Cricut, you will need to download the SVG file. If you are using a Silhouette machine, you can download the .Studio file or the DXF file. I have packaged all three files up into one download so you will get all three. Here is a great article on the different file types that are compatible with the Silhouette machine. You can access the files in the resource library, below. Love cut files and want more? You can find all my cut files here.